Though each one is small in volume, oil spills from small vessels add up. In Washington State, when you multiply this volume by the thousands of fishing and recreational boats on the water, they compose the largest source of oil pollution in Puget Sound. 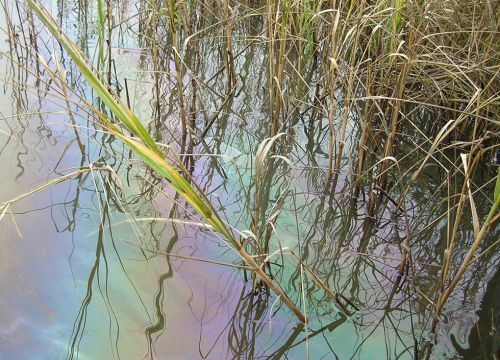 How do small oil spills happen? The two most common causes are spillage during refueling and bilge discharge, when oil accumulates along with water in the bottommost compartment of a boat and then gets pumped out… I sat down with Aaron Barnett, Washington Sea Grant’s Boating Specialist and the coordinator of Washington’s Small Oil Spills Prevention Program, to find out what boaters can do to prevent small spills. He offered this handy checklist of measures for keeping your vessel in ship-shape and stopping spills before they become a problem. Tighten bolts on your engine to prevent oil leaks. Bolts can shake loose with engine use. Replace cracked or worn hydraulic lines and fittings before they fail. Lines can wear out from sun and heat exposure or abrasion. Outfit your engine with an oil tray or drip pan. You don't need anything fancy or expensive; a cookie sheet or paint tray will do the trick. 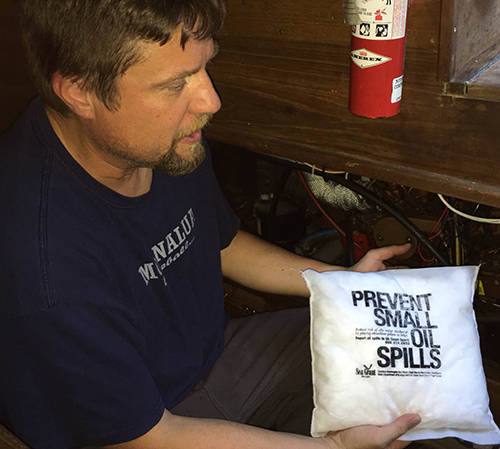 Create your own bilge sock out of oil absorbent pads to prevent oily water discharge. Here’s a helpful how-to guide from Cap’n Mike (Coast Guard Auxiliary Instructor Mike Brough). Avoid overflows while refueling by knowing the capacity of your tank and leaving some room for fuel expansion. Shut off your bilge pump while refueling – don’t forget to turn it back on when done. Use an absorbent pad or a fuel collar to catch drips. Always keep a stash handy. If spills do happen, it’s important that boaters manage them effectively. Spills should immediately be contained and cleaned up with absorbent pads or boomed to prevent their spread. Notify the Coast Guard and your state spill response office, per federal law, and let the marina or fuel dock staff know about the incident, so they can assist. This is a guest post by Lauren Drakopulos, a Science Communications Fellow with Washington Sea Grant and is pursuing her Ph.D. in geography at the University of Washington. Lauren has worked for the Florida Fish and Wildlife Conservation Commission and her current research looks at community engagement in fisheries science. Washington Sea Grant, based at the University of Washington, provides statewide marine research, outreach and education services. The National Sea Grant College Program is part of the National Oceanic and Atmospheric Administration (NOAA) U.S. Department of Commerce. For more information or to join the conversation @WASeaGrant on Facebook, WASeaGrantTwitter and Instagram.